M. Puncekar Illustration: Finally getting to post. My monkey. I have more work to do, more papers to write, but heck with it. I've been doing the blog thing just regularly enough to seriously feel weird when I can't throw something up. This week has been hectic to say the least. Been working on Art of Illustration stuff almost exclusively. So close to being able to put it up on here. So close. Unfortunately last time I screwed thigns up when I put the unproofed poster up, and with other problems, submission chaos ensued. It's amazing that we have still held our heads above water, and have almost pulled this thing off. 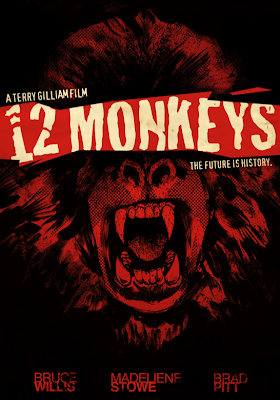 For now though I'll post my 12 Monkeys DVD cover final for black and white (Two color print on distressed/stained paper). This one got seriously put off until the last minute as I hadn't gotten to even start the final until after comicbook class tuesday, at 9:30. I'm so very, very ready for spring break. Sadly enough teachers have buckled me down enough that I don't think any personal projects will be coming. All papers and such. Anyway, click to view the comps from the previous post. It feels so good to submit something on here again. I feel relief or something. Weird kind of drug, this blogger. Looks rad. I didn't realize the previous mock ups were just comps. I love the quick technique you used in the comps, they could have been finals themselves. Any good illustration assignments for Spring Break? Aside from paper writing and catching up on sleep, I always had mad fun spending way too much time noodling the illustration homework that followed me home for Spring Break. Thanks for the words, sir. I have to save my comicbook cover over break, and maybe work on a riot scene thing I've had going for awhile. I'm excited to post it, but saving it for when it's done. Hoping to turn it into a series of stuff I can hopefully show in a gallery someday. Just a bunch of dystopian, panicky, societal riots, heavily figure oriented with objects. At least the main not illustration thing I have to do is a presentation on James Jean. Which ain't half bad. completely misleading. I went to the video store and saw this cover, I immediately assumed this was a feel-good nature documentary on apes(a dozen of them to be specific). All of a sudden Brad Pitt is on my tv freakin out about boardgames being locked up. Boy was my face red. But seriously, your crazy style is a perfect partner for gilliams...well...crazy style. I enjoy vurrry much, sir.